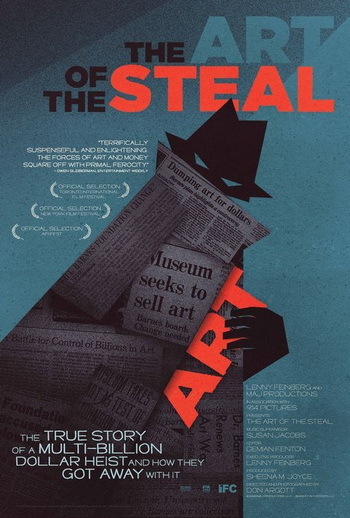 This weekend, I got a chance to see the captivating doc, The Art of The Steal, which details the “transfer” of the art collection of The Barnes Foundation, which houses some of the most valuable 19th and 20th Century Impressionist artworks in America (lots of Renoirs, Cézannes, and Matisses) from a small educational institution in Pennsylvania to The Philadelphia Museum of Art. The film brings up many interesting questions about the big business of culture, so whether you view the film as a non-profit corporate takeover (which the filmmakers obviously do) or just a conspiracy theory, it’s definitely worth adding to your Netflix list. Plus, for all you mighty poster collectors out there, the film advises the importance of drawing up an iron-clad will to protect your wishes and those of the future owners of your most prized pieces! This entry was posted in 2000s posters, Documentary movie posters and tagged barnes foundation, ifc, philadelphia museum of art, the art of the steal by russ. Bookmark the permalink.